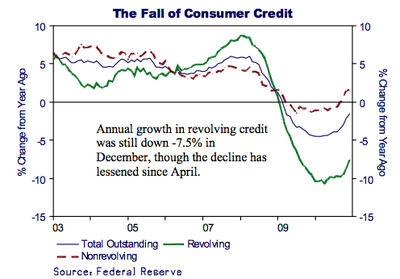 Consumer Credit: The Final Piece Of The Recovery Pie Or Hair Of The Dog? In the short-to-medium term it’s hard not to be heartened by the fact that for the first time since 2008, revolving consumer credit (credit cards) increased sequentially in December. First, the chart. 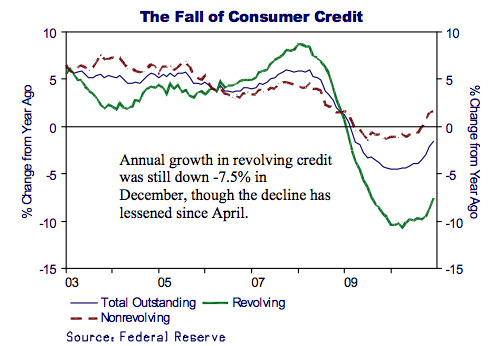 And bear in mind that on a year-over-year basis, revolving credit is still negative. There’s a big hole to be dug out of. The fact that December showed the first increase in credit card usage since September 2008, the same month that Lehman Brothers collapsed and deepened the financial crisis, could be saying one of two things. decided to splurge on gifts again, but were forced to dust off their credit cards in order to afford it. of debt, and after one year of steady job and income growth (however meager), households are getting more comfortable with their financial health such that the stigma of using one’s credit card may be lifting somewhat. Certainly, if the increase in credit card usage in December wasn’t also accompanied by recent improvements in consumer confidence and lower default rates then we would be less upbeat about this new development in the consumer credit market. 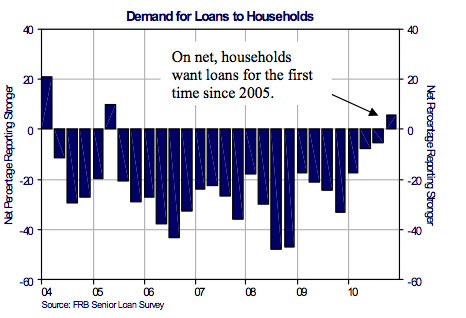 Not everyone has taken the report as good news, however, saying that households may simply be up to their “old ways”. And that is understandable given the sorry state of affairs household balance sheets were in just a few short years ago. Our nation’s love affair with credit, which really took off in the mid-1940’s when middle- class lending opened up, morphed into a countrywide debt problem of monstrous proportion by the time the recession hit in late 2007. When the recession hit, households were forced to sober up quickly and credit turned from representing a golden opportunity, to something dirty akin to using crack. Dovetailing nicely with the rebound in revolving credit is this from the latest Fed Senior Loan Officers Survey, which shows growth in household loan demand for the first time in quite a while. Again though, none of this really satisfactorily answers whether this is the final piece of the pie, or just hair of the dog (or whatever the equivalent metaphor is for “crack” as Zentner puts it). As for whether this is healthy or not, this post from PragCap answers that nicely: Monetary stimulus encourages the public to take on more debt (by making it cheaper), whereas fiscal stimulus could actually help deleverage the private sector, but that’s not a very popular idea. Eventually we’ll have to pay it down again.